The daily Dharma talk is an important part of insight meditation retreats, especially if one listens with mindfulness, focus, and a clear idea of one’s purpose for listening. It’s possible to listen to a talk with the same dedication given to sitting and walking meditation. This can cultivate a receptivity that brings many benefits beyond that of the instruction, understanding, encouragement, or inspiration a talk may provide. That it is useful to cultivate a receptive state of mind when listening to a Dharma talk was well known in ancient times. Texts describe the Buddha as giving his most liberating teachings when his listeners were “ready, receptive, free from hindrances, uplifted and trusting.” He understood this to be important enough that he sometimes focused on getting the audience ready and receptive by first offering teachings which “inspired and gladdened” them. Because the benefits of a Dharma talk increase when we are receptive, it is useful to prepare for a talk beforehand. Meditating shortly before a talk can calm any agitation or preoccupation that hinders listening. Being seated well before the talk begins gives time to assume a posture conducive to listening, perhaps sitting in a way that is both comfortable and attentive. It allows time for the body to settle in, the mind to become quiet, and for us to assume an attitude of interest and receptivity. Being receptive to hearing a talk is more than being willing to listen; it is also a willingness to learn something new and to be changed by what one hears. Considering our intention and purpose for listening is also useful for becoming ready and receptive for a talk. This is especially helpful if our usual way of listening is dominated by preferences about what we like, dislike, agree with or disagree with. Bringing intention to how we listen to a talk can also correct for any excessively passive receptivity where there is no personal engagement or choice in how to listen. Dharma talks are not events in which we settle back and let someone else entertain us. The receptivity of listening to a talk is an active receptivity. A common approach to listening to a talk is to focus on learning what is being taught. For this purpose we may bring with us a notebook to write down teachings that seem particularly useful to review later. Or we may choose to listen attentively enough to remember what is being taught, recognize the structure and logic of the talk, and actively reflect on what we hear. This can be augmented by repeating or narrating in our own minds what we are hearing. At times we may decide to allow the words to wash through us without lingering in thought about what we are hearing. This strategy works well if we listen with an open awareness while staying mindful in the body, as if we were listening through the body. Trusting that our mind will take in and remember whatever teachings are important for us at that time can help with this. Sometimes the teacher’s quality of being while giving a talk can be a greater teaching than what the teacher says. The teacher may convey a sense of calm, confidence, enthusiasm, compassion, or freedom that can be both inspiring and instructive. This may give us a direct experience of the point of what is being taught. When this is the case we can decide to focus on feeling, sensing, or attuning our self to the way the teacher teaches or to the quality of mind the teacher manifests. Another option is to listen as a meditation practice focused on the words spoken and the voice speaking. Sometimes the tone, rhythm, and pace of a talk can help our mind become still, quiet, and concentrated. Some meditators find themselves more concentrated listening to a talk than in any other circumstances, including in meditation. Such concentration states can be particularly effective opportunities for certain teachings to penetrate deep into the mind, perhaps catalyzing significant insight. Among the many ways of listening to a talk, occasionally, and only occasionally, we can decide to use a talk as a break from focusing on exhausting personal issues or meditation challenges. As a wholesome distraction, the talk may provide rest, relaxation, and a reset that refreshes us to reengage with the meditation practice of the retreat. 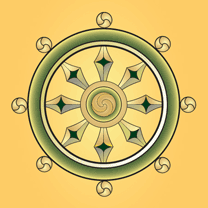 Two primary factors help us decide what approach we can take when listening to a Dharma talk. One factor is the purpose that the teacher has for giving the talk. The second is what is most suitable for ourselves and our practice at the time of the talk. Sometimes it is good to listen in a way that is receptive to the teacher’s purpose. Other times it is best to listen in a way that supports the personal circumstances of our own practice and purpose at the time of the talk. Ideally we would find a good way to match the purpose of the teacher with our own circumstances as a meditator. Teachers choose from many purposes when they teach. Sometimes their intention is to provide useful instruction for a particular phase of the retreat. Sometimes it is to provide encouragement and inspiration for the practice. Other times Dharma talks are given to place the practice in contexts or to provide perspectives that help meditators with the many changing experiences, challenges, and joys of retreat practice. At times, teachers tell stories that not only illustrate teachings but also move us emotionally in ways which let the teachings penetrate deeper or help us switch our moods to ones that are more supportive of our retreat practice. Occasionally, teachers may use a Dharma talk to model or transmit a way of being rather than imparting particular teachings. And sometimes all of these purposes can be present in a single Dharma talk. If we can recognize the teacher’s purpose we then have the option to adjust ourselves accordingly. With instructions, we can focus on learning and remembering them. When practical teachings and perspectives are offered we can reflect on when and how these may be useful for us. When a story is being told we might allow ourselves to get absorbed in the story. When we recognize that we can receive the most learning and inspiration from how a teacher is, we can turn our attention to hearing, observing, or feeling the teacher’s quality of being more than reflecting on what is being spoken about. We can also consider our own personal circumstances in deciding how to listen to a talk. If we are in need of instruction, encouragement, inspiration, or new perspectives, we can decide to listen attentively to what is being said. If our own meditation practice has a lot of momentum or if some personal challenge is unfolding in significant ways we may choose to continue with our practice without paying attention to the particular content of the talk. If it seems we are getting concentrated in listening to the talk we might give ourselves over to this concentrated listening, allowing the mind to get more and more settled and calm. If personal qualities of the teacher are meaningful, we might let this register deeply. Over time, people who go on retreats will learn a range of ways listening to Dharma talks. The more approaches to listening we cultivate, the more we can benefit from the many dimensions of Dharma talks. When we enter into the practice of listening to dharma talks, we join the millions of people for whom, for 2500 years, the primary contact with Buddhism has been through listening to Dharma talks. Our sincere wish to live a good life can build on the sincerity of the many people whose listening has kept the teachings alive since the time of the Buddha.